Grandma Gwen, back in the day + Me, yesterday. Growing up, I was blessed to have a family full of teachers around me. My dad's dad taught math, subjecting me to daily lessons over summer break – only to be saved by Grandma Thelma who wholeheartedly believed in dessert breaks. My mom's dad was a college professor, and my mom currently teaches in Fayetteville, North Carolina. 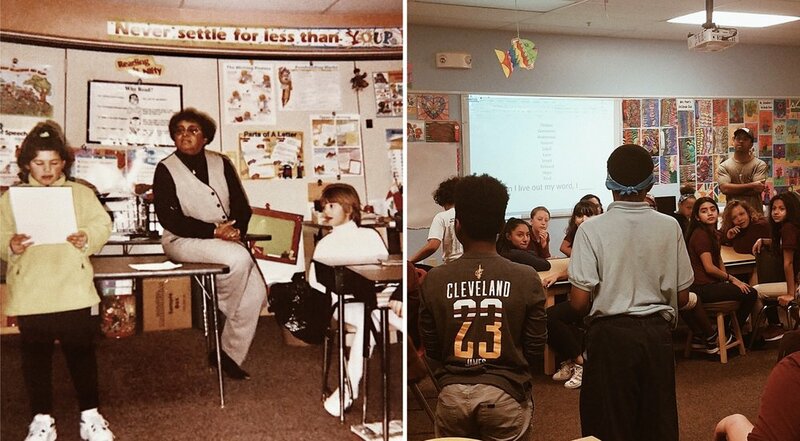 But today, I want to introduce you to my grandma, Gwendolyn Watts, who served as an educator for over 40 years. Grandma Gwen was my best friend. She taught at my elementary school, so we spent many early mornings together as well as evenings after the bell rang. Her students, as well as her coworkers, loved her – often trying to spend as much time with her as possible. But who wouldn't want to hang out with somebody who saw any opportunity to eat and laugh as a party? While I admired Grandma Gwen's vibrant spirit, I believe the greatest gift she ever gave me was permission. I'd venture to say that's a gift all great teachers give to their students. Great teachers see the best in us and help bring out our potential, even though we may not be able to see it in ourselves at first. They show us what could be, inviting us to see the possibility in what we once thought was impossible. Through her words and deeds, Grandma Gwen gave me permission to pursue a life of love, a life where I'm free to operate from kindness rather than judgment. She showed me there's no greater joy than committing yourself to a life in service of others. Grandma Gwen passed away nearly seven years ago, but I still see the ways in which her life is impacting mine. As historian Henry Adams wrote in his autobiography, "A good teacher affects eternity; [she] can never tell where [her] influence stops." These days, I'm blown away I get to follow in Grandma Gwen's footsteps and play a small part in kids' lives through Car Window Poetry. After writing poems with a group of 4th graders yesterday, a little boy came came up to me and said, “You’re inspiring.” Then, he started crying and went on to share how he always seemed to feel down but, during our workshop, he was inspired to see the light within himself and share that light with others. If it wasn't for Grandma Gwen and so many other teachers like my mom, Ms. Cison, and Dr. Hatcher who helped me believe in the gifts God has given me, I would've never set foot in that classroom yesterday or even thought to start Car Window Poetry. Teachers, thank you for giving kids like me permission to be the best version of ourselves. May we never forget the power we have to not only activate dreams in others, but to activate our own dreams as well. Click here to receive encouragements like this in your inbox every week!